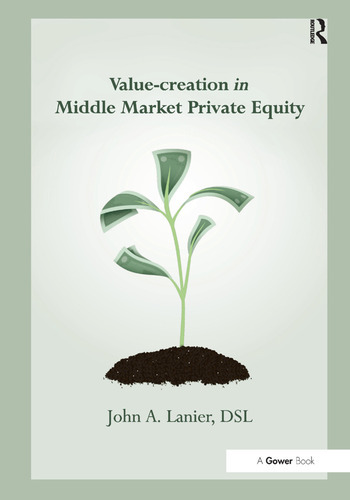 Value-creation in Middle Market Private Equity by John A. Lanier holistically examines the ecosystem relationships between middle market private equity firms and their portfolio companies. Small business is the job creating engine in the US economy, and consequently is a prime target market for private equity investment. Indeed, private equity backs over six of each 100 private sector jobs. Both the small businesses in which private equity firms invest, and the private equity firms making the investments, face inter- and intra-company fiduciary leadership challenges while implementing formulated strategy. The architecture of each private equity firm-portfolio company relationship must be uniquely crafted to capitalize on the projected return on investment that is memorialized in the investment thesis. Given the leveraged capital structure of portfolio companies, the cost of a misstep is problematic. Individual private equity professionals are typically members of multiple investment teams for the firm. Not only may each investment team have its own unique leadership style, but its diverse members have to assimilate styles for each team in which they participate relative to a specific portfolio company. Acquisitions and their subsequent integrations add exponential complexity for both private equity investment and portfolio company leadership teams; indeed, cultural integration ranks among the most chronic acquisition obstacles. Accordingly, the stakeholders of private equity transactions do well to embrace leadership best practices in applying value-creation toolbox best practices. The perspectives of both the private equity investment team and the portfolio company leadership team are within the scope of these chapters. John A. Lanier is a partner at Excellere Partners, a Denver, Colorado-based private equity firm, where he focuses on strategy and operations. Before joining Excellere Partners, John was founding CEO of Middle Market Methodsâ„¢, a consulting practice serving private equity portfolio companies. John’s engagements include more than 30 private equity sponsors (including Excellere, where he was awarded the 2012 Project Expert of the year) and over 100 portfolio companies across numerous industries. John’s value-creation toolbox is a byproduct of more than 300 deliverables over 14 years. Additionally, John is a co-founder of DealMidas.com, a turnkey, cloud-based origination management system specifically designed for private equity, venture capital, and hedge fund firms. John holds a Doctorate in Strategic Leadership from Regent University, an MBA from St. Leo University, and BBA in Finance from the University of Georgia. Additionally, John is a GE Six Sigma Master Black Belt and change-management facilitator.